Bearing the Tiny Monster moniker the TM10K is the latest and greatest from Nitecore. Equipped with an OLED display and USB-C with QC 2.0 protocol, the TM10K is the most technologically advanced light by Nitecore to date. Multifunctional OLED real-time display for lumens, voltage, runtime and temperature etc. *DUE TO HEAT GENERATED, THE TM10K CAN ONLY SUSTAIN TURBO OUTPUT 7 SECONDS AT A TIME. TURBO CAN BE REACTIVATED AS LONG AS THE SYSTEM TEMPERATURE IS LOW ENOUGH. The TM10K will display a countdown bar if it is too hot to activate Turbo. 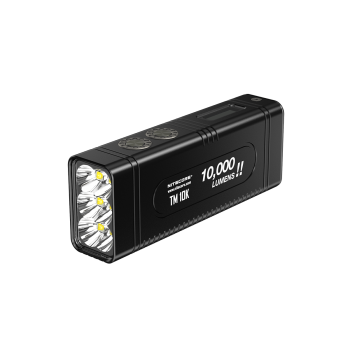 **The HIGH brightness level is customizable between 400-2,000 lumens (Default: 1,000 lumens). The runtime is tested in default brightness without temperature regulation.